Do I have Frontal Fibrosing Alopecia? Do I have FFA or not? FFA of the frontal hairline. Frontal fibrosing alopecia is increasingly common. It's still a relatively rare condition overall but there is no doubt that the number of women being diagnosed is increasing. On account of the increase individuals in the general public are much more aware of this otherwise uncommon diagnosis. Patients often want to know if they have this condition. The short answer is that anyone wondering if they have FFA really should see a dermatologist for a comprehensive review and examination of the scalp. I enjoy helping patients understand why they do or do not have FFA. Many patients are convinced they have FFA when they clearly do not. The following are some pieces of information that patients frequently feel points to a diagnosis of FFA when it fact it does not. Following this, I have outlined 5 pieces of information that actually is helpful (and increases the odds somewhat that a true diagnosis of FFA could be present). Exceptions of course exist and nothing replaces an in person review for an up close examination. In my experience with countless numbers of patients who think they have FFA (but don't).... the following pieces of information are not helpful to making the diagnosis even though patients may think that it is! Comment 1: "My hairline is changing"
Why is it not helpful? Hairlines change for many reasons including androgenetic alopecia, traction alopecia, alopecia areata and telogen effluvium. Frontal fibrosing alopecia is certainly on that list but there are too many reasons for frontal hairloss to make the observation of hairline changes a key feature for diagnosing FFA. 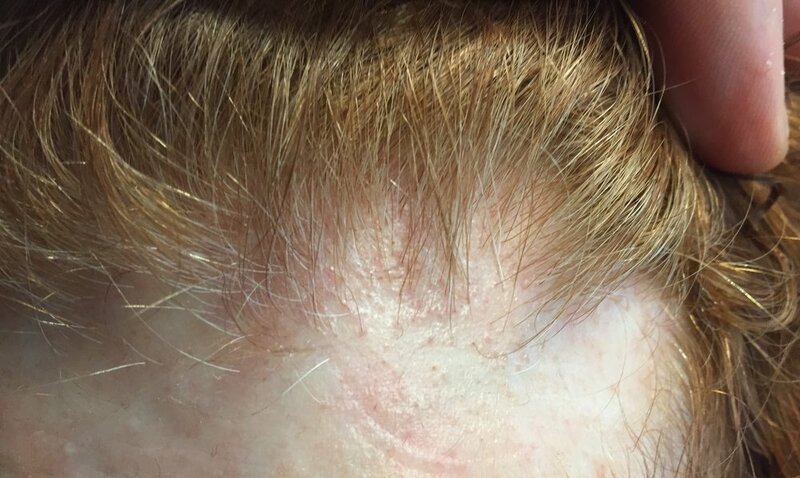 A patient with hairline changes could have FFA but could have other conditions too. Comment 2: "I see 'lonely' hairs"
Not everyone knows what a lonely hair is. But a patient who understand what is meant by a "lonely hair" has generally done a lot of reading and are extremely knowledgeable about hair loss! The reality however is that most "lonely hairs" that most people find in the scalp are not what really constitutes the gist of what these hairs are all about. My feeling is that the presence of more than 6 hairs across the frontal hairline at a distance of greater than 1.5 cm from the main hairline probably does in fact raise suspicion for true 'lonely hair' phenomenon. Comment 3: "I have redness and scarring in my scalp"
Redness alone does not constitute a diagnosis of FFA. In fact, FFA tends to be more pinkish and subtly red than overtly red. There are simply too many scalp conditions that cause redness to give this observation any significance. I'm always concerned when patients feel they can "see scarring" because one can't truly see scar tissue as it is mostly under the scalp. In advanced scarring alopecia, one certainly can see evidence of scarring but these cases are usually fairly advanced. In all fairness, one can however see scalp color changes (mostly to a white color) that would suggest the presence of scarring. However, one can't actually see scarring. Comment 4: "I now have so many baby hairs"
Baby hairs are not really a feature of FFA. In fact, the presence of baby hairs probably argues against the diagnosis of FFA for most patients than actually favours the diagnosis. This is because FFA tends to be a destructive process that involves the preferential destruction of baby hairs (medically termed vellus hairs). The presence of abundant baby hairs is not a feature of progressive FFA. Comment 5: "I have no family history of balding so it only makes sense something else is going on"
Nothing can substitute for a careful review of one's story and examination of their scalp with dermoscopy. The following pieces of information are helpful when considering a diagnosis. Not all patients have the following features, but they greatly increase the odds that what we are dealing with is FFA. FINDING 1. Both sideburns are lost (above the ears). Not thinned but lost. The regions below where the spectacle of the glasses sit has been depleted of hairs. Loss of the hair frim both sideburns is actually quite an important piece of information when it comes to diagnosing FFA. This finding is mot present in everyone with FFA but is quite common if one looks. FFA is a process that destroys fine vellus hairs - but it does so with inflammation. The presence of small amount of inflammation (usually without symptoms) is a key finding. Eyebrow loss is common in FFA and in a large number of individuals with FFA, they are the first finding. Eyebrow loss of course does not happen in all women with FFA and loss of eyebrows may even come after the loss of the frontal hair. However, significant eyebrow loss requiring tattooing, microblading does raise the odds a bit that the presentation fits with possible FFA. Still, one needs a careful examination before concluding that anyone's eyebrow loss is FFA. Nevertheless, changes in the eyebrows are common to FFA. FFA is rare in the 20s and 30s. That's not to say it can't occur as we have patients in their teenage years affected. However, from a statistical point of view, women under 40 who come in with worries that they have FFA actually rarely end up having FFA. There are exceptions of course but it is not a common occurrence. In our clinic, 98 % of patients who receive a diagnosis of FFA are older than 46. FINDING 5. Veins are seen much easier on the scalp than before and the skin itself just does not look quite normal. FFA is a complex condition and is probably more than just a 'hair disease'. It's likely a complex autoimmune disease that affects hair predominantly but also affects the skin as well The skin itself changes in FFA - and does so by thinning. We call this "atrophy." Some women with FFA have minimal to no atrophy but many have significant atrophy which leads to the veins becoming much more visible. Generally, the skin in the area of the hairline does not look the same as the skin of the forehead - the affected area in FFA is lighter in color and smooth. Frontal fibrosing alopecia is a complex condition. There is no 'one way' that it appears. There are 100s of different combinations. Navigating the diagnosis oneself is frequently met with challenging. I've summarized here 5 points that patients place a great deal of emphasis on when looking at their hair - but actually don't carry all that much weight when making the diagnosis.